[Printed pamphlet for the "Empire Day" Movement. (Non-Party and Non-Sectarian.)] "Empire Day," May 24th. Letters, Address, and Information in regard to the "Empire Day" Movement. Open Letter from the Earl of Meath. 20pp., 12mo. In fair condition, on aged paper, with lightly rusted staples. Stamp, shelfmarks and labels of the Board of Education Reference Library, London. Meath's letter is printed on pp.1-4, and is followed by an 'Appeal by the Earl of Meath to Churches and Congregations of All Denominations within the Empire.' (p.5), and an address by Meath on 'The "Empire Day" Movement' (pp.6-13). The last three items in the pamphlet are the songs 'God Save the King' and 'The Flag of Britain', both with musical scores, and Kipling's poem 'Recessional'. Six Typed Letters Signed from officials of the Cambridge University Press to J. G. Wilson of London booksellers J. & E. Bumpus: four from Walter Lewis, Printer, and one apiece from S. C. Roberts, Secretary, and assistant manager R. J. L. Kingsford. The six letters, all on Cambridge University Press letterheads (three different types), Cambridge (5) and London. Dating from between 24 September 1931 and 5 July 1932. The six items in good condition, lightly-aged and with slight rust spotting. Four of the letters concern an exhibition of the CUP's work at the Bumpus store, 350 Oxford Street. Lewis's four letters are all signed 'W. Lewis' and on his own CUP letterhead. One: 24 September 1931. 2pp., 8vo. In reply to Wilson's congratulations over the exhibition he informs him that he will be sending his son ('subject of course to your consent'), 'who has been in the printing [sic] now for two years and should know something of types. Printed programme of of 'A talk by A. W. Brooks Esq. | Assistant General Manager', Westminster Bank Limited, titled 'The Computer - and You', with photographs and fold-out diagram of 'Current a/c Book-Keeping - Computer System'. Westminster Bank Limited, Electronic Methods and Research Department, 41 Lothbury, London, EC2. Talk at Central Hall, Westminster; 9 April 1963. An attractive item, printed in black, blue and red on both sides of a piece of 40 x 56cm. paper, folded twice to make a 20 x 28cm. packet. In good condition, lightly-aged with a short tape stain on one edge. Four black and white photographs: two showing a smiling Reginald Maudling, with before/after captions 'At the inauguration of the City Computer Centre, the Chancellor of the Exchequer presses the button and starts the Reader/Sorter . . .' and '. . .
[Printed items.] 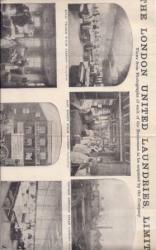 Prospectus and application form for 1897 flotation of London United Laundries, Limited, with poster carrying fifteen photographs of 'Businesses to be acquired by the Company' and publicity flier headed 'A Great Laundry Amalgamation'. Prospectus 'Dated May 27th, 1897, London'; Roberts & Leete, Ltd., Printers, London. Other three items contemporaneous. All items in good condition, on lightly-aged paper. ONE: Prospectus. Folio, 7 pp. To raise share capital of £230,000. 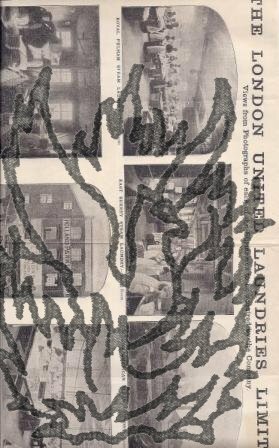 Lists the '13 modern Steam Laundries', four 'Receiving Depots', 'Dyeing and Cleaning Works' and 'recently-established Laundry Supply Stores' the company was being 'formed to acquire as going concerns, and still further develop'. Includes section on 'Advantages of the Amalgamation', auditors' and valuers' reports and memorandum of association. TWO: Application form. Folio, 1 p. Perforated, with 'Bankers' Receipt'. THREE: Publicity flier. Folio, 2 pp.